So last week’s Lutz Koepnick reading was on my mind as I listened to the audial version of Castle of Otranto. Available for free on http://archive.org/details/castle_of_otranto_0810_librivox, this audial book (you’ll see why I’m calling it that in a moment) is read by what appears to be an anonymous reader and (or perhaps because) it contains some added effects for flavor. Just two of the colorful bits: there is one non-verbal sound effect added to the text (rain & thunder), and the reader performs quite the Italian accent for Fr. Jerome. Skill-related complaints and the ‘why only Jerome’ question (the Sicily reference?) aside, this reader/producer is constructing a highly performative text. Though some may disapprove of a performance that considerably alters the original text (in this case, with the addition of elements such as the thunder or the accent), such an attempt shows the reader/producer to be aware that, “[listeners] appear drawn more to the performer than to the author, to the dramatic aspects of interpretation” (Koepnick 235). Sure enough, users have posted only complimentary reviews that praise specifically these added elements, or what ‘Rare Clones’ calls, “‘Dark and Stormy Night’ sound effects” (the other two reviewers compliment his ‘voices’). Even without sound effects or particularly skilled readers, audible books provide interpretive opportunities — Otranto, for instance, undergoes a major shift between the third and fourth chapter: a rapidly unfolding – some say random – narrative gives way to a series of intimate, highly sentimental sequences in which Isabella, Mathilda, and Bianca speak of their amours and set each other’s sentimental strings vibrating. This shift became noticeable to me precisely because of the audible format: I found myself having to return to earlier points in the chapter in order to determine exactly who was saying what, a problem that did not occur once while listening to the less dialogue-heavy first three chapters. This audial format works like one of those little fixes – like turning off a film’s sound – it that opens new pathways to critical noticings. To me, all of this ‘for you’ amounts to a pedagogical imperative. Last semester, when leading my students through Scott’s Border ballads, I made sure to play some audio clips of solid readings of Burns – not only relevant in showing where Scott was coming from and why there was a precedent for the popularity of such texts, this also demonstrated that much pleasure, much meaning is to be found in a text’s audial elements. When, later in the semester, they were reading mid and late Victorians writing in (sometimes better, sometimes worse) affected working class accents, they realized that the whole point was to read or imagine the audible elements of the text. So many of our (especially nineteenth and eighteenth century) novels were written by authors aware of performative readerly practices – it may behoove us to consider the scholarly opportunities, the potentials for deformance, afforded by the audial. This entry was posted in Uncategorized on April 11, 2013 by adamkozaczka. I would like to take Golumbia’s arguments even further and suggest that Ramsay’s celebration of ‘making’ as the future of literary and cultural studies appears to draw the troubling distinction between ‘making’ and the by implication ‘making’-free – dare I say unproductive – scholarship that predated it. To do what literary critics do best, I’ll consider some economic terms like ‘labor’ out of their proper disciplinary contexts (more on decontextualized specifics later). To suggest that ‘making’ is new for scholars effaces a certain aspect of the labor involved in producing scholarship that is not reliant on digital technologies. Just, as Golumbia points out, ‘the digital’ is already a huge factor in scholarship across disciplinary divides, there are existing scholarly pursuits by those who can’t code that are equally interested in ‘making’ as scholarship. It is, in fact, the literary historicist’s desire to compose scholarly articles that not only present ‘ideas,’ (now, I mean this only in the sense of Scheinfeldt’s blog; in his way of opposing ‘big ideas’ to ‘methods’), but also revel in the show-and-tell aspect of simply digging something up and saying ‘here it is’. I’ve heard ‘theory people’ use this as a personal reason for disliking historicism: it is perpetrated by academics less interested in making arguments and more interested in sharing cool objects. I mean ‘cool objects’ quite literally – as a graduate student that does lots of cross-disciplinary work with dress culture studies among other fields, I find the most compelling scholarly work to be precisely about making, perhaps not of kilts themselves (I study Celtic masculinities), but of scholarship that seeks to interact with physical objects in ways that go beyond mere description. The use of decontextualized scholarship from other fields is, in my honest opinion, a remarkable skill that is well cultivated by literary critics (to those who don’t know me, this may sound like sarcasm; but it’s not – I am a champion of productivity found in sloppiness). Another time, you may witness me claim that a satisfying state of the field would be one in which we are free to creatively dabble in the technical aspects of digital disciplines in much the same way as we permit ourselves to ruffle the feathers of historians, psychologists, and economists by using and perhaps abusing the findings, key concepts, and vocabularies of their fields. This is part of the reason for which I do not see the path between Ramsay’s devoted teaching of coding to individual humanists and the second of his conference-complicating assertions, “Do you have to know how to code? I’m a tenured professor of Digital Humanities and I say ‘yes.’” Why the leap from the importance of teaching a useful skill that enhances research to a tenure-based claim about the role of coding as a fundamental aspect of literacy for those who ‘make’? What about my suggestion from a couple of weeks ago that a published piece of DH scholarship (I guess like Eric S. Faden’s video & surrounding apparatus,) might draw conclusions that could be invaluable to a piece of ‘standard’ scholarship. In fact, that video is arguably a substantial entrance into the conversation established by that Schivelbusch book. So I envision a kind of collaborative climate in which a scholar writing a traditional academic essay that seeks to enter the same conversation would be encouraged (or even ethically compelled) to mention Faden’s contribution. It is in this collaborative climate that I see the DH as having the most tangible impact on the field as a whole: whereas not all humanists will learn how to code, they will have to learn how to account for and incorporate the work of the increasing proportion of those that do. This might be as systemic as more interactive formats for the online editions of the top peer-reviewed journals, or it might be as individual as a conference presentation that spends two or three of its allotted minutes to showing or (preferably) otherwise interacting with something like the Faden video. Rather than, like Fitzpatrick in the Golumbia example, encouraging the graduate student to do a digital project because it’s the new thing (I bet that’s why the student was so vague – she didn’t know exactly what she wanted to do, just that those maps people have cool looking finished products… so far we’ve proved that ‘making’ is seductive), there should be an evaluation of how the digital enhances the given project and how it would aid in its completion. This means that some projects will be more welcoming of DH methods and ways of defining knowledge than others, but that’s a good thing. But let’s stay away from the divisions between ‘reading’ and ‘making’; between ‘big ideas’ and ‘methodologies’ — they’re too close for comfort to that ubiquitously drawn line between ‘saying’ and ‘doing’ that already makes our lives as academics so difficult in the arena of popular opinion. Oh, and the Ramsay stuff on ‘making’ that I’m referring to can be found here, though my references to the discussion were mainly through Golumbia. This entry was posted in Uncategorized on March 27, 2013 by adamkozaczka. The split English department fantasy that opens Jordan’s post seems like an increasingly possible, and increasingly pleasant reality. I say ‘pleasant’ because I don’t feel that I need to change myself into a computer-assisted distant reader in order to benefit from the work of the folks who, “almost certainly have become worse close readers” (Wilkens 256). I have a hard time getting fired up over the close reading debate (as Wilkens is – a few points in his piece read almost as direct provocations to those prepared to be upset by comments like, “we [the entire profession, I guess] need to do less close reading;”  Wilkens appears to be taking seriously the kind of back-and-forth joshing visible in one of Ben Schmidt’s responses to Ted Underwood’s blog: “Can’t tell you how many times I’ve almost finally convinced a humanist that close reading is obsolete and only computers can truly appreciate an author’s intentions, only to lose them at the last moment by carelessly saying ‘corpuses’ instead of ‘corpora.’”) long parenthetical notation, so I’ll start again: I have a hard time getting fired up over the close reading debate because I feel that in a scholarly community even those uninterested or unschooled in the DH can benefit from the results of distant reading. Part of the discussion in those responses to Underwood’s blog that I mention involves the intelligibility of DH findings to what the interlocutors were loosely referring to as ‘humanists’ — I’m interested in a split English department reality in which the distant readers provide the ‘humanists’ with opportunities for further research and reading without a theoretical framework that invasively insists on that time spent reading and studying forgotten novels is valueless. Two weeks ago, I questioned Moretti’s gestures away from what I called the ‘individual case’ in “Graphs” and “Trees” (if you recall, I suggested that by seeking patterns that are discernible without an intimate knowledge of the text, Moretti’s theoretical model was in fact discouraging or maybe even foreclosing on the [usually historicist] scholar who is working on excavating individual forgotten novels). In talking about the “material limits such [close] reading imposes,” and calling for, “more algorithmic and quantitative analysis of piles of text too large to tackle ‘directly,’” (255-6) Wilkens makes a heavier and less compromising version of this argument. After reading this, Moretti’s take is no longer as jarring — in “Maps,” he uses his Parisian lover-map (don’t fail out of grad school because of Proust, guys) to assist at a similar demonstration: it is not about, “a cluster of individual locations,” but it is about getting a spatial understanding of the, “matrix of relations,” that demand love interests to exist in distant (at times, specific) quarters or on opposite sides of the river (54-6). Moretti’s version of the claim is more palatable than Wilkens’ because rather than eliminating the need to read several decades worth of forgotten French novels, it provides an invaluable, distant-reading derived observation that enhances the reading of one or more of those novels. My own understanding of space in literary Paris has actually been altered for the better after my brief encounter with Moretti’s map – I hold that I do not have to recenter my research on algorithmic methods in order to make use of the work of those who have done. Next time Monsieur Charlus crosses the Seine, I’ll know what he’s up to. This entry was posted in Uncategorized on March 7, 2013 by adamkozaczka. Ah! Life Falling Apart! Expect Post Later Tonight! What I have so far is crappy and needs rewriting – please be patient, readers, and await my post later this evening (I’ve got a seminar until 6:30, and then screening from 7:00-10:00, so likely a D-time of 11:30/12:00… any time after midnight or tomorrow morning would be a good time to return if you’d care to comment, which I’d appreciate though know I’m not encouraging by putting off this post until later tonight). This entry was posted in Uncategorized on March 6, 2013 by adamkozaczka. My apologies for a disorganized post – two incredibly loose responses to the “Graphs” and “Trees” sections of Moretti. Next week, I may continue with a higher quality post on “Maps”, so keep an eye out. In a 1988 chapter on Sherlock Holmes that contains a most fabulous argument about Watson, Moretti writes, “the deepest desire of the current sociology of literature is to ‘forget’ literature… If this is the case, then literary criticism can only hope to be the novelesque surrogate for more substantial disciplines. This would then reconfirm the role of cultural filler assigned to literary studies – which aimed at being ever so subversive – by the ministries of public education during the past half-century. At this point, it would be more logical and more honest to take up a different profession” (131). I’m not quoting this to somehow suggest that Graphs, Maps, and Trees falls into this trap – Precisely the opposite is true: Moretti is aware of this discipline-perforating potential as he writes Graphs, Maps, and Trees, and takes care to locate the relevance of his ‘findings’ in the context of what is useful and appropriate to literary criticism. To stick with Holmes, it is the detective story’s inclusion of ‘clues’ as devices that is shown to determine its market success via Moretti’s tree on page 73 of G,M, T. The process of distant reading, in other words, locates the instances of a device in a given text or set of texts, and seeks to determine the other commonalities between these texts that share the device (in this case, market success). In his introductory arguments, Moretti suggests two possible ways of finding meaning through graph-assisted distant reading: the ‘theorist’ might imagine downturns and upturns in literary production as parts of a larger, ‘up and down’ cycle, whereas the ‘critic,’ “look[s] for individual cases (Napoleon, reprints, the cost of paper, whatever)” (13-4). Collapsing the distinction, he chooses an intermediate method of interpretation that employs genre to delineate temporally bounded cycles of literary production – there is, in his words, a ‘hidden rhythm’ to the rise and fall of genres (20). Though doubtless encouraged by graph-mindedness (I hold that to make data graphable is to argue that there must be a hidden rhythm, even if the graph does not make it immediately apparent), this conclusion elides the usefulness of the less digital historicism that is precisely interested in the ‘individual case’ and how it relates to ‘Napoleon, reprints, the cost of paper, whatever’. To take the perhaps stretched examples of the ‘rises’ of the novel from the beginning of the first chapter, it is historically and geographically specific economic conditions that make possible the ‘rise of the novel’. These conditions differ from place to place, and to put them carelessly together on a chart is almost a return to theories of ‘uneven developments’ (if ‘the novel’ is one, unified concept). After screening (which starts in 5 mins and ends at like 10PM), I will post a Japanese example to clarify. Edit: the Japanese example to clarify my hastily written second paragraph above. Not editing the above text… it’s bad, but it’s on its own. Though I have no knowledge of the early Japanese novel, the timing of its rise seems perfectly in tune with a period of socio-economic transformation in the late seventeenth and early eighteenth centuries in which a remarkably populous warrior class (comparable in percentage to only Poland or maybe Hungary or Spain) was forced by political and encouraged by geographic imperatives to shift into a landowning capacity. It is an Asian History 101 gesture to bring up Yamamoto Tsunetomo’s Hagakure (1709-15) in this context: Hagakure is full of maxims for the conversion of the samurai’s battle-readiness into a sort of economic readiness (the proper shepherding of peasants, for instance, is a topic touched on by the text — to grossly undervalue its beauty and complex context/function, it’s basically a handbook for a member of a forcibly pacified warrior class). Hagakure and the shift that it is taken to represent are an ‘individual case’ – knowing that the ‘rise’ of the Japanese novel coincides with the near aftermath of this emblematic shift in roles of the ruling and middling classes allows the researcher to suggest that the enforced replacement of samurai-as-warrior with samurai-as-landowner (or paid servant of wealthier samurai landowner) impressed itself onto a literary register both as the rise of the novel and likely in its subject matter. What a marvelous way of reading the plots and settings of these early Japanese novels: what was the relationship between the shift in the role of the educated classes and the subject matter of the texts their novelists wrote? There is, in other words, a benefit to tracking down the ‘Napoleon’ and the ‘whatever’. This entry was posted in Uncategorized on February 20, 2013 by adamkozaczka. First, some brief comments about Jerome McGann’s interest in the critic/archivist divide and a plug for literary historicism; then, an attempt at the IVANHOE game. Since our discussions have kept coming back to the question of payoff (of what new information is gained by reformatting texts to fit new digital formats), and we seem – at least for the purposes of the class – to be interested in asserting that their *is* a payoff, then it is precisely in the critical application of the editing process that such payoff lies. At various points in his text, McGann uses sentences smoother than my previous to express a sort of divide that has marginalized the editor and archivist by suggesting the critic or philosopher to engage in deeper and more scholarly pursuits (18). This claim continues to resurface in the book: at various points he laments the academic culture that has limited the perceived scholarly value of the editorial and archival pursuits that are best aided by the kinds of interventions promised by digital textualities (103, 213). It is thus perhaps a mission of the IVANHOE game and of its precursors to demonstrate how, “purely archival and editorial,” work can be blended with, “critical and reflective functions” (16-7). The promised plug: a common thread of mockery directed at the literary historicist is that his or her essays begin with narrativized anecdotes about something he or she found in the archive. There is, in other words, a community of scholars who is quite interested in the story of their own engagement with the dusty manuscript (I’ll try to update this post in a few days with a quote from an essay that does just this; plays something like the IVANHOE game as part of its ‘attention getter’). Disclaimer: I’m sorry that I use something so specific to my own research that I don’t leave you guys much room to play with me — I’ll try to post additional moves later on and make this into an onanistic extravaganza that is fun to watch. 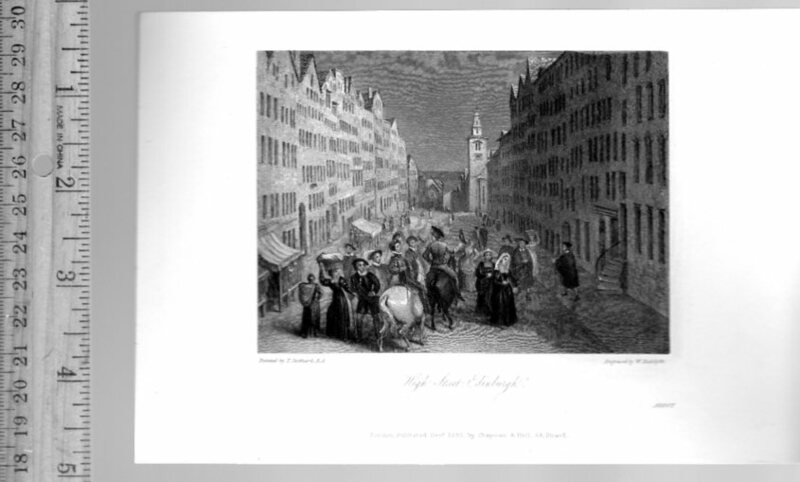 Player Profile: portraying a fictitious student/assistant of Thomas Finlayson Henderson (1844-1923), a specialist in Scottish literature on the Cambridge faculty in the late nineteenth and early twentieth century (prolific output in terms of scholarly works on Scottish Ballads and Vernacular, Burns, James VI & I, and [the] Mary Stuart). Henderson’s collections of Scott-related essays started coming out in 1907, so I date this piece 1906. If I were playing more seriously, I would have tracked down the names & partial biographies of one or two among Henderson’s real assistants so as to include details from their lives in my ‘moves’ (details, of course, that would tint their readings of the documents at hand, and open new critical directions based on their imagined experiences/viewpoints). My fictitious student/assistant is a bit lazy or perhaps is overworked, and has enlisted the aid of his leisured bosom friend, John Booby. The descendent of the much famed Squire Booby who acted as a model for Fielding’s character of the same name, John is a red-faced, coursing gentleman who can run down texts with hart-like tenacity. I have received the plates to the Waverly novels that you so naively entrusted to the care of a veritable Baker Street Irregular of a lad – to think, had he absconded with the volumes (the smell of rich leather drives the East Ender mad, I’m told), our best chance to examine Mr. Tilt’s earliest collection of Waverly prints would have been forfeit. I applaud the spirit of your gesture, for such honesty as you expected should pervade even the darkest corners of the Empire’s capital. There is, however, a certain family flaw visible in your giving him less than an hundredth of the volumes’ value in payment and expecting him to deliver them intact. And what if such a grubby boy should be stopped on the London and Northeastern by a conductor who felt himself to be a truant officer? There may come a day (shudder I to think of it, friend John) when a gentleman may no longer hold up a sovereign and procure the messenger-services of the nearest-by ragamuffin. 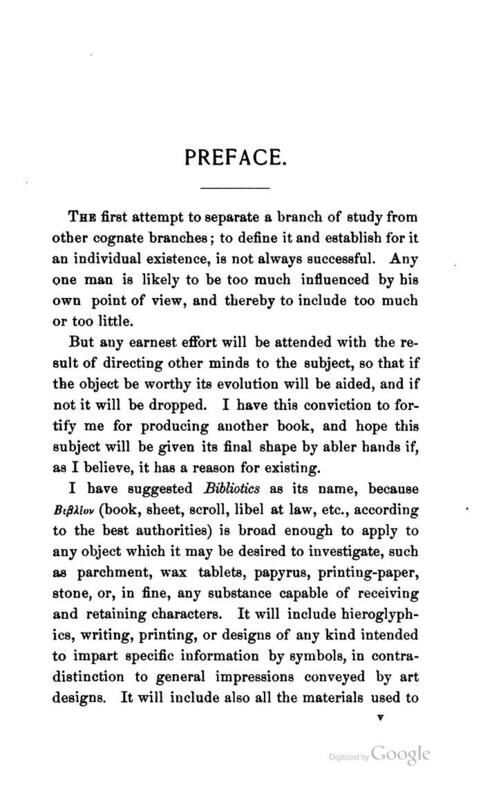 This London publication doubtless became more popular as time went on, and this potentially offensive comparison was removed in later editions – I’m not sure how Henderson will receive this, but even if it has no bearing on his research, it will serve as something to talk about when ignoring the Mathematicians at dinner this evening. So, those are real collections of plates that my fictional character mentions. Tell me, is what I did the IVANHOE game, or have I missed the point and written fan fiction? This entry was posted in Uncategorized on February 6, 2013 by adamkozaczka. I come to this photograph of a Gettysburg veteran by way of a parenthetical notation in Matt Kirchenbaum’s Mechanisms, New Media, and the Forensic Imagination (2008). In his chapter on computer forensics, Kirchenbaum explores the histories both of data storage and of reading practices that aspire to detective functions – alongside an analysis of data in terms of permanence and the attendant debates (exigent, as the author points out, in the early nineteen nineties and even earlier), the chapter arrives at computer forensics by considering the long history of examining documents for clues to criminality. 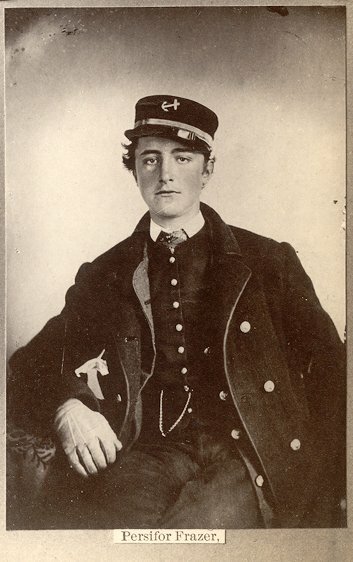 Significant enough to deserve an aside is Persifor Frazer, the pictured military intellectual and the kick-off point for my blog on the digital nineteenth century (more information on the blog later – Persifor Frazer demands the attention of this first post). Kirchenbaum’s engagement with Frazer is brief, but it pays a bit of homage to a scientist whose work with the recognition and analysis of handwriting makes him relevant to both the developing detective genre of fiction and the rise of disciplinary structures that sought to surveil the darkest corners of the decaying metropolis. Kirchenbaum footnotes his mention of Frazer with a reference to Sherlock Holmes; the Encyclopedia Sherlockiana (1979) lists nine Sherlock Holmes stories and novels in which the careful examination of handwriting yields clues as to murderous identity. 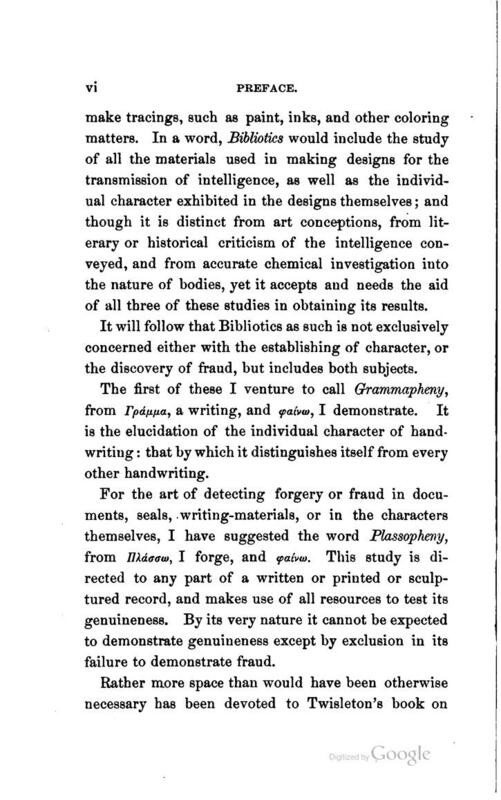 Doyle doubtless was aware of Frazer’s Bibliotics: or The Study of Documents; Determination of the Individual Character of Handwriting and Detection of Fraud and Forgery (1894) – in fact I surmise that some research might yield a direct reference by Doyle to this text. Bibliotics likewise impacted the legal community, and Frazer was called as an expert witness at celebrated turn-of-the-century murder cases, the most famous among which being Brooklyn’s Molineux case of 1901. It is the coincidence of literary, legal, and scientific innovation that makes Frazer such a fascinating figure to an interdisciplinary nineteenth centuryist, or more broadly to any scholar of reading practices. Frazer’s book articulates a way of interacting with text that may seem brutal or uselessly exhaustive, but which actually has a great deal in common with the styles of reading encouraged by a twenty-first century graduate-level education in English literature and criticism. In an introductory note, Frazer explains his self-originated term, ‘Bibliotics’ (he was a scientist! Nowadays, only literary critics can come up with words like that): “I have suggested ‘Bibliotics’ as its name, because Βιβλίο (book, sheet, scroll, libel at law, etc. according to the best authorities) is broad enough to apply to any object which it may be desired to investigate, such as parchment, wax tablets, papyrus, printing paper, stone, or, in fine, any substance capable of receiving and retaining characters. It will include hieroglyphics, writing, printing, or designs of any kind intended to impart specific information by symbols, in contradistinction to the general impressions conveyed by art designs.” I could stop now, but it gets hotter: “It will include also all the materials used to make tracings, such as paint, inks, and other coloring matters. In a word, Bibliotics could include the study of all the materials used in making designs for the transmission of intelligence, as well as the individual character exhibited in the designs themselves; and through it distinct from art conceptions, from literary or historical criticism of the intelligence conveyed, and from accurate chemical investigation into the nature of bodies, yet it accepts and needs the aid of all three of these studies in obtaining its results.” In a sense, we’re dealing with an early mandate for attention to a kind of inter, extra, meta (and maybe even hyper) –textually. Adding a nineteenth century voice to the ‘is literature data?’ debate, Bibliotics expands the concept of ‘text’ and by locating the technical aspects of writing as evidence. Below you’ll find my list of references including links to a wonderful UPenn archive on members of the Frazer family along with a link to the e-book version of Frazer’s 1894 text (if you check this one out, be sure to glance at his analysis of George Washington’s signature; also, the appendices include a piece written by a medical doctor and another written by a judge). This entry was posted in Uncategorized on January 23, 2013 by adamkozaczka.